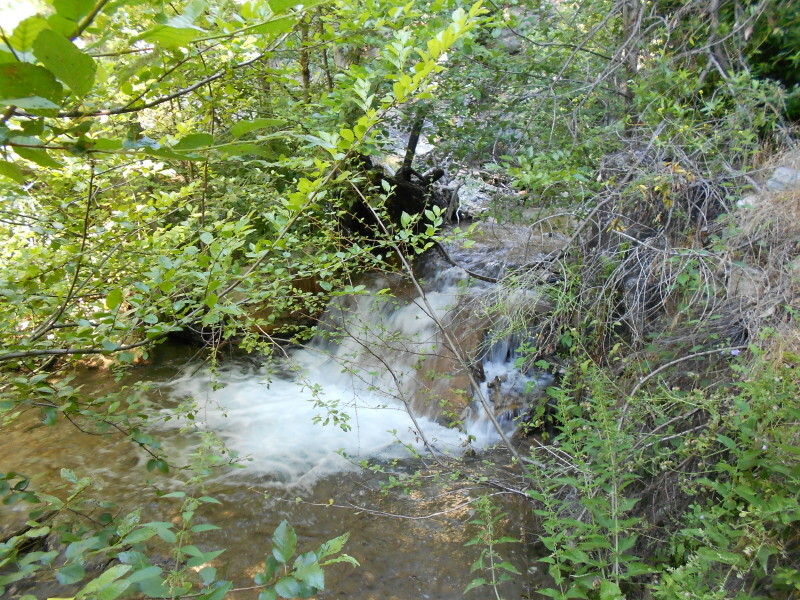 Fed by springs and snow melt from the Crystal Lake basin, woodsy Soldier Creek gurgles and gushes its way into the North Fork San Gabriel River. En route the water courses through a narrow gap in the rocks and plunges 50 feet into a sparking pool. This dramatic water feature is called Lewis Falls, named in honor of late district ranger Anselmo Lewis, who once patrolled these parts. On September 1, 2002, the Curve Fire was ignited on a sweltering Sunday afternoon and quickly consumed more than 20,000 acres of the Angeles National Forest, including much of the Crystal Lake basin. Beautiful Soldier Creek canyon sustained some damage but the area around Lewis Falls was spared the devastating incineration that other areas experienced. Because of the massive damage caused by the Curve Fire, The Forest Service and CalTrans closed Highway 39 just above the West Fork, denying motorized public access for nearly nine years. On March 22, 2011, Highway 39 was finally reopened and Lewis Falls once again beckons urbanites to enjoy its tranquil beauty. The easy half-mile walk to Lewis Falls offers a sylvan retreat and is doable for most folks and children, although, it's a little rustic in places. Majestic trees, lush vegetation, colorful wildflowers, and the soothing melody of a babbling brook all add to the charm of this delightful setting. Keep in mind that at 4,000 feet, it could get cold and even have snow in the winter. During the spring snow melt, the falls can be quite showy but the creek crossings may be dicey. The poison oak looses it leaves in the winter and its barren branches are still coated with the toxic oil, so be aware. See Seasons of the San Gabriels for a detailed description of minding the seasons. From Interstate 210 in Azusa, take Azusa Avenue (Hwy 39) north through Azusa and into the San Gabriel Canyon. At about 3 miles from the freeway you'll pass the Forest Service Gateway Center (1960 North San Gabriel Canyon Road (Hwy 39), Azusa, CA 91702.) on your right. Note your odometer. Continue driving up Hwy 39 for 17.6 miles (about 2 miles past Cold Brook Campground) to a hairpin where the road crosses over Soldier Creek (mile marker 34.8). 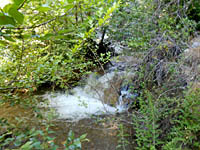 Park on the right side (north) of the road and begin your hike on the trail which begins on the right side of the creek. There's a yellow "No Fires" sign there. A National Forest Adventure Pass is required for parking. From the trailhead follow the path that begins on the east (right) side of the creek heading upstream. You'll stroll under a canopy of cedar, fir, pine, bigleaf maple, California bay, white alder, and oak. Shortly you will pass the first of two cabins that survived the Curve Fire. There is a lot of poison oak and stinging nettle along the trail, so be alert. Wildflowers add a splash of color, particularly in the late spring and summer. You will pass a second cabin and ruins of other cabins along the way. After about 0.3 mile you pass the last cabin foundation and the route drops to the creek bottom and crosses the creek to the west bank (be particularly carefully in the wet season when the rushing water could pose a risk). The route is still manageable as the canyon narrows. You'll climb over some large rocks (young children may need some assistance) and continue along the west bank. Passing a large log that spans the creek, your route skirts along the steep bank on the left, drops back down to the creek, and in about 30 yards you arrive at the base of Lewis Falls. 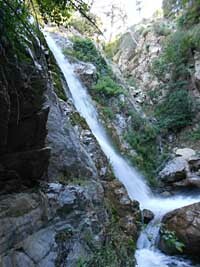 To get the best view of the falls, which tumbles over the rock face on the west canyon wall, cross over to the right side of the creek. A few well-placed rocks make crossing doable, but it could get dicey when the steam is swollen. The literature lists the falls at 50 feet high, including a top tier, which is mostly out of view from the bottom. A fine mist dampens the area and makes footing slippery, so watch your step. Enjoy the tranquil setting and return the way you came. 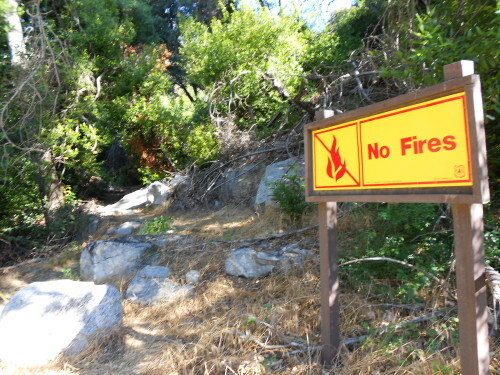 Trail Conditions: The trail is not formally maintained so it may get a little brushy and debris from the fire-damaged mountainsides is still being washed into the canyon. 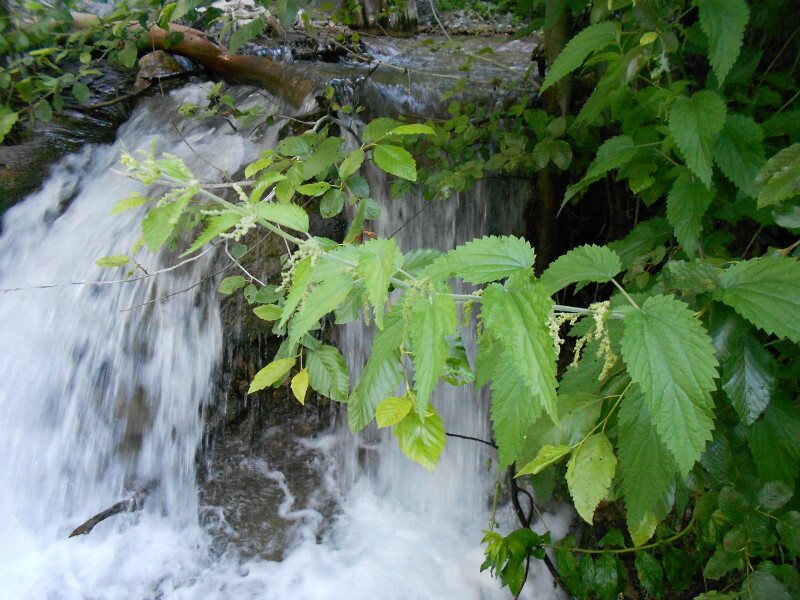 Plant Hazards: Watch out for abundant poison oak and stinging nettle. Elevation: Various authors report various elevations for this trail. The elevation for the trailhead as stated by Jerry Schad seems reasonable at 3870' (according to the topo map). Both Schad and Chris Brennen put the falls at 4300' (which matches the topo map), thus an elevation gain of 430 to 460, however Schad states the elevation gain as 300 (John Robinson - 250, John McKinney 200), which is 130 feet short if you simply subtract the trailhead from the falls. Other online postings list it at 300 feet gain but are probably just parroting the classic authors without doing their own math. If we put the gain at 430, that equals a gain of 830 per mile, which is much steeper than reality. So I've messaged the numbers to make the math work, sticking with the 300 gain and adjusting the elevation of the falls. Trails of the Angeles: 100 Hikes in the San Gabriels - by John Robinson (Wilderness Press). 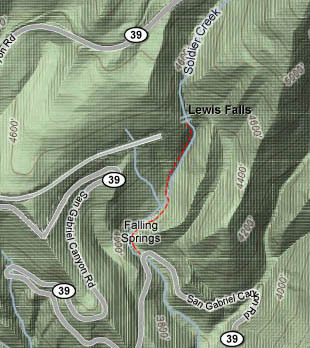 Hikes 75: "Soldier Creek Trail--Highway 39 to Lewis Falls." Good trail description. Added a blub about the Curve Fire but did not change the route description to reflect the changes. Puts the round trip at 1 mile with 250 feet gain. Afoot and Afield in Los Angeles County - by Jerry Schad (Wilderness Press, Second Edition, Sept. 2000) - Area A-9, Trip 1: "Lewis Falls." Brief trail description. Puts the round trip at 0.8 miles with 300 feet gain. This page was last updated November 16, 2013.